Laura Walker and Kirk Muyres got by with a little help from their friends during Friday round-robin action at the Curling World Cup in Suzhou, China. The Canadian mixed doubles pair weren’t even on the ice when they qualified for Sunday’s final. With the top team from each pool qualifying, Walker and Muyres anticipated locking up the berth during the round robin on Saturday. However, Sweden helped out during the final draw on Friday, rallying from a 5-0 deficit to a 7-6 victory against Norway. Sweden’s win dashed Norway’s hopes of qualifying and gifted Canada the spot in the final. Walker and Muyres, of Edmonton and Saskatoon respectively, split their pair of games on Friday. Canada started the day with its first loss of the competition against Kristin Moen Skaslien and Sander Olav Rølvåg of Norway. Walker/Muyres were backed into a corner from the start after giving up three points in the first two ends. 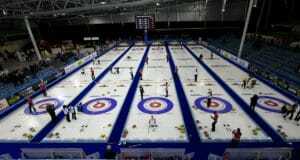 While they scored a single point in the third, Norway tacked on singles in the fourth and fifth ends to lead 5-1. 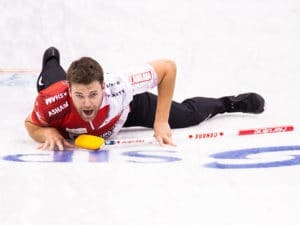 Walker landed a draw for three in the sixth end to bring Canada back into the game at 5-4, but Norway responded with three points of its own in the seventh. Canada put a single on the scoreboard in the eighth, ending the game with an 8-5 loss. The morning loss made Canada’s afternoon game against Russia’s Maria Komarova and Daniil Goriachev all the more critical. Walker and Muyres didn’t disappoint, doubling the Russians 6-3 for their fourth victory in the double round robin. Walker opened up the game for Canada in the fourth end by scoring three on her last shot with a runback triple. Walker and Muyres have one more game left in the round robin and it’s coincidently against the team that helped them qualify for the final. Canada will take on – and get to thank – Sweden’s Therese Vestman and Robin Ahlberg (2-3) on Saturday. Kevin Koe is also closing in on a spot in Sunday’s final with two games to go. Koe and his Calgary-based team of vice-skip B.J. Neufeld, second Colton Flasch and lead Ben Hebert came from behind to win a 7-4 game against Peter de Cruz (Switzerland) on Friday. The Swiss scored a deuce in the sixth end, tying the game at three, and added a steal in the seventh end for the one-point lead. Canada was left with a difficult angle runback on its last shot of the game, which Koe hit just right to score four and take the victory from Switzerland’s hands. “It wasn’t an easy one but luckily I had played one right in the same spot a couple of ends earlier, so I had a good idea what it would do. I threw it pretty good and got the line call right. 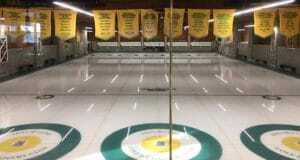 That’s a big win for us,” Koe said. 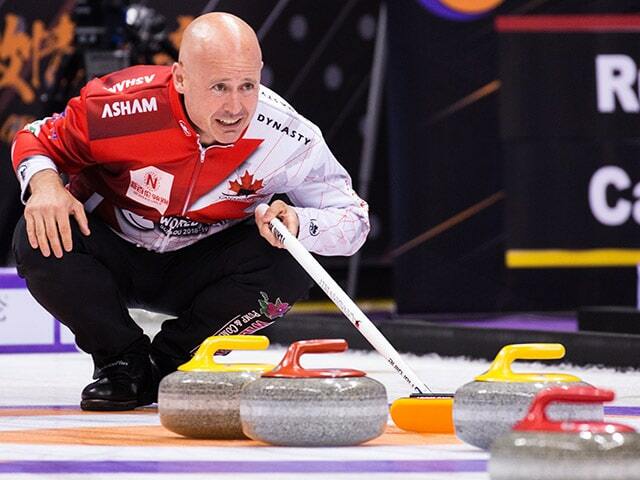 Koe has two more games to go in the double round robin and controls his destiny in regards to advancing to the final. 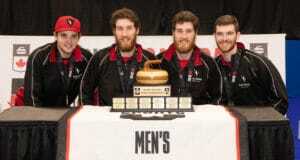 On Saturday Canada plays Scotland’s Bruce Mouat (3-1) and Masaki Iwai of Japan (0-4). Rachel Homan’s team is looking poised on the ice at the Suzhou Sports Centre. Her team tacked on another two victories on Friday to remain atop her pool. First Canada, played Nina Roth of the USA in a game between the only two unbeaten teams in the pool. Homan, vice-skip Emma Miskew, second Joanne Courtney and lead Lisa Weagle made quick work of the Americans, stealing a five-ender in the fifth end. Roth and her team shook hands and conceded 9-1. Team Homan closed out the day with an 8-2 win against Anna Sidorova of Russia. Steals of three in the fifth end and two in the sixth put the game out of reach for Russia. “We’re playing really well, picking up on the ice and it’s nice to come out with another win. It felt like we were in control. We had a really good handle on the draw weight and what the sheet was doing,” Weagle said. 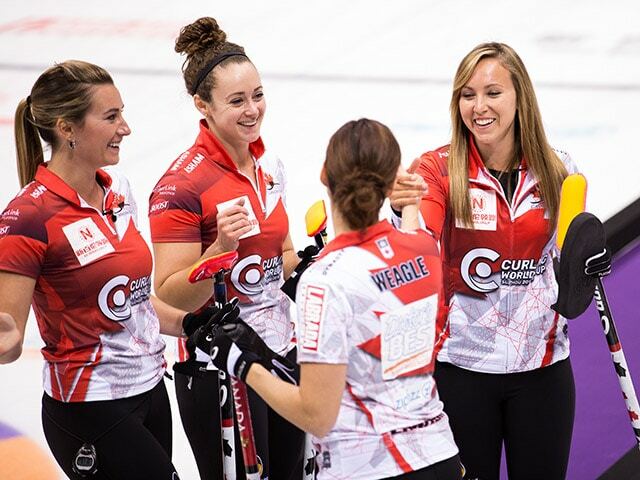 The Canadian women’s team plays two games on Saturday to complete the double round robin. First, against Minji Kim of South Korea (0-4), and Roth (3-1) once again in the evening.